To discuss the elements or compounds determined with the help of polarography in different types of samples like food stuff, sea water, fuels, etc. To discuss other industrial important determinations for traces or minor constituents. 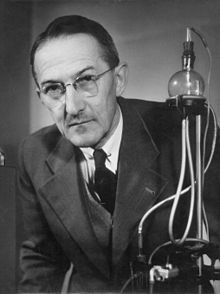 Jaroslav Heyrovsky received Nobel Prize in chemistry in 1959 for his discovery and development of the polarographic methods of analysis. He is known as the father of electroanalytical method. Polarographic method directly contributed to the development of innovative ideas in electrochemical techniques, instrumentation and applications. Voltammetry comprises a group of electroanalytical methods widely employed in analytical chemistry and other industrial processes. In voltammetry the information about the analyte is obtained from the measurement of current as a function of applied pote ntial, under the conditions of complete concentration polarization. Voltammetry is widely used by inorganic, physical and biological chemists for nonanalytical purposes, such as the studies of the oxidation and reduction process, adsorption process in various media, and electron transfer processes at chemically modified electron surfaces. Polarography, is a branch of voltammetry, is the study of the electrolysis of solutions of electrooxidizable and or electroreducible substances between a dropping mercury electrode (DME) and some reference electrode (RE) which is saturated calomel electrode (SCE). This falls into the general category of linear-sweep voltammetry. In this the electrode potential is usually altered in a linear fashion from the initial potential to the final potential. The only difference in polarography is, the working electrode takes the form of a dropping mercury electrode(DME). 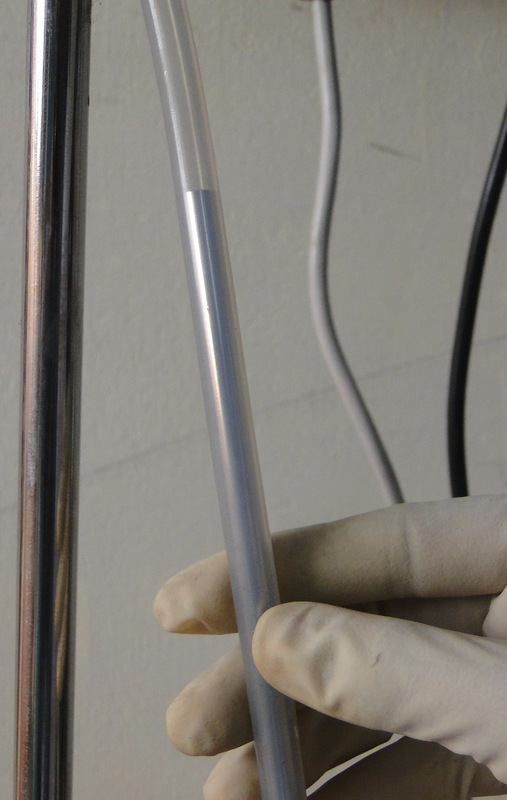 It consists of about 10 cm of a fine capillary tubing through which mercury is forced by a mercury head of about 50cm. The diameter of the capillary tube is adjusted in such a way that a new drop will form and breaks at specific timings; usually 2 to 6s. The drop time can be controlled by a mechanical knocker that will help to dislodge the drop at a fixed time after the drop begins to form. 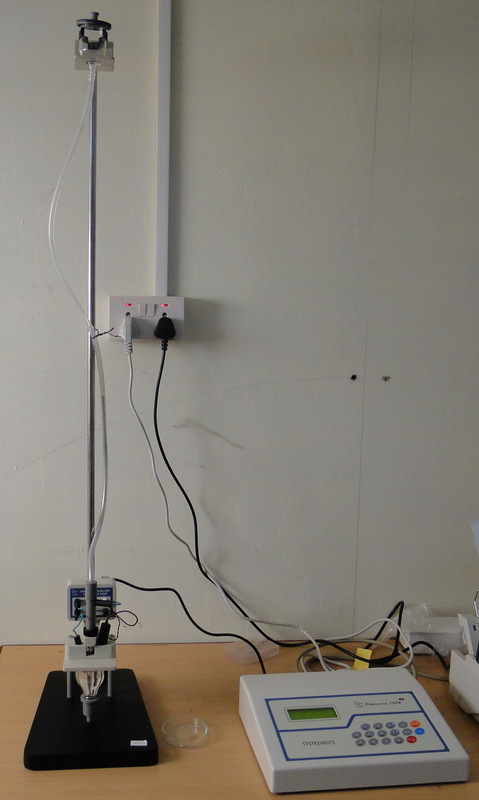 The potential between the reference electrode and DME is varied and the resulting change in the current flow is measured. Since the linear sweep method is controlled by combined diffusion or connection mass transport method, the resulting the current versus potential response i-E curve is known as Polarogram and it is sigmoid in shape(S-Shape). The position of a wave in a polarogram along the potential axis provides an identity of the substance while the magnitude of the limiting current provides the concentration variation of this material. 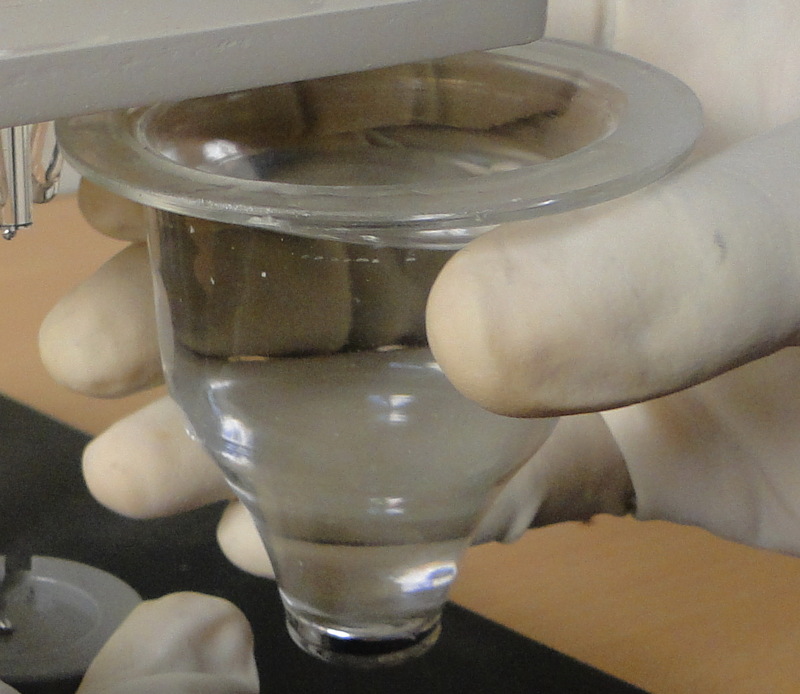 Since there is an increased flow of current at the starting region of the polarographic wave there is a marked decrease in the concentration of electro-active substance at the surface of the electrode. With the increase in voltage and current the concentration of the reactive species reaches to a minimal value near to the electrode surface. The current is then limited which depends on the diffusion rate of the reacting species from the solution to the electrode surface. The rapid increase of current at the final stage is due to the supporting electrolyte in the reaction. Since the concentration of the electrolyte is too large within the applied potential range, it will prevent the reactive species to reach the electrode by the electrical migration process, and hence the limiting current is assured as diffusion controlled. Residual current is the slowly increasing current at the foot of the wave which is non faradaic in nature. 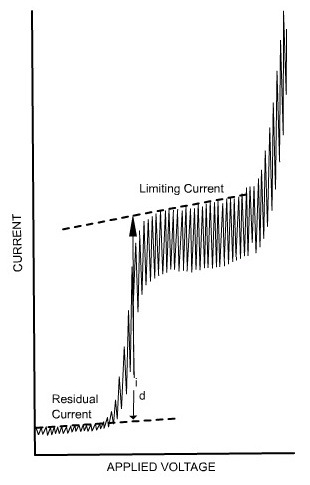 The distance between the limiting diffusion plateau and the residual current is known as diffusion current (id). The potential at the midpoint of the wave is represented as half-wave potential E1/2, in this region the current is exactly half its limiting value. 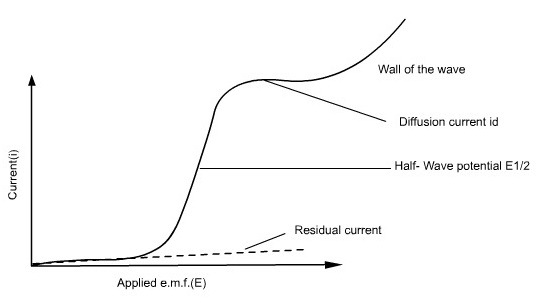 The limiting current is found to be the sum of the diffusion residual current. The wave height can be calculated by subtracting residual current from the limiting current. id = average diffusion current during the life of the drop(µA). D= Diffusion coefficient of the analyte in the medium (cm2/s). n = Number of electrons transferred per mole of analyte. m = mass flow rate of Hg through the capillary (mg/sec). c = analyte concentration (mol/cm3). Polarography is used widely employed for the analysis of trace metals in the alloys including ultra-pure metals, minerals/metallurgy, environmental analysis, foodstuffs, beverages and body-fluids, toxicology and clinical analysis. In the biological systems it is used to determine vitamins, alkaloids, hormones, terpenoid substances and so on. In medical field polarography is used to analyze natural colouring substance of drugs and pharmaceutical preparations, determining pesticide or herbicide residues in food stuffs, and in the structure determination of many organic compounds. Since a fresh, smooth, reproducible drop is produced at regular intervals of time contamination or surface poisoning will be limited. Prepare stock solutions of Cd2+ ion by dissolving 1.0 g of Cd2+ per 1 liter. From this take 1.0, 2.0, 3.0, 4.0, 5.0 mL into 100 mL volumetric flask. Add 50 mL of 2 M KCl solution and 2.5 mL of 0.2% gelatin solution to each flask and then dilute to the mark with distilled water. Take 10 mL of unknown solution in a volumetric flask. Add 50 mL of 2 M KCl solution and 2.5 mL of 0.2% gelatin solution and then dilute to the mark with distilled water. Record the polarograms of five standard solutions and unknown after deaeration. Draw the calibration curve taking wave heights (id) of all five standard solutions as ordinates and concentrations (c) as abscissa. From this the concentration corresponding to wave height of unknown is noted. Place 10 mL of unknown solution, 5 mL of known stock solution (of calibration curve method), 50 mL of 2 M KCl solution and 2.5 mL of 0.2% gelatin solution in a volumetric flask and then dilute to the mark with distilled water. Record the polarogram of this solution in a polarographic cell after removing dissolved oxygen with nitrogen. Draw the standard addition plot and calculate the concentration of unknown solution.